Published 201 years ago, in 1818, Mary Shelley’s novel Frankenstein is not only one of the most commonly assigned books, but it is also the basis for the Western horror story and the inspiration for numerous movies, television shows, and Halloween costumes in the 20th century. Beyond the monster clichés, the original story of Frankenstein is much more than just pop fiction. The novel has a lot to teach us today, especially for those looking to explore the future of innovation. Just like Dr. Victor Frankenstein, educators are eager to “pioneer a new way, explore unknown powers, and unfold to the world the deepest mysteries of creation” – and what better way to explore and create than at EdTechRVA. One of the best parts of EdTechRVA is networking with both new and familiar faces who represent our mission. 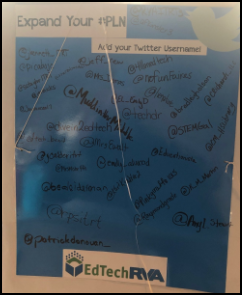 During the conference, we encouraged people to expand their PLNs by sharing their learning through social media and adding their handles to our collaborative poster. Here’s an editable Google doc where you can continue to share and build your connections. During our keynote, led by Robbie Moose (principal) and Jason Vest (teacher), we were inspired by how Hungary Creek Middle School (@HungaryCreekMS) is building life-ready middle schoolers by implementing a maker-culture while also working within the confines of state mandates. If you couldn’t be there with us, check out a recording of the keynote here. 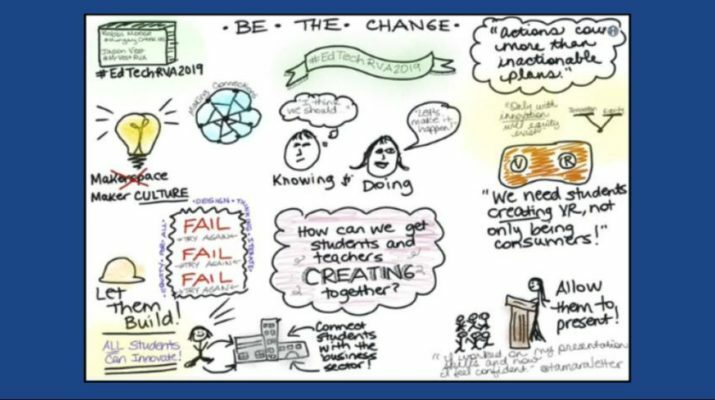 Tamara Letter couldn’t have summed up the keynote better with her sketchnote above. We enjoyed a wide range of sessions from interactive 45-minutes sessions, to ignites, and poster sessions. Session topics focused on future-ready learning and included anything from STEM and coding to ones that promote creativity, collaboration, citizenship, critical thinking and communication. If you couldn’t find a way to clone yourself and make it to all the sessions or you just couldn’t make it to the conference in general, take a peek here to access session materials. Frankenstein is still an excellent vehicle for introducing students to a broader conversation about creation, innovation, and responsibility. Just like Victor Frankenstein relentlessly questioned the limits, how far to push them, and the implications of what we do in the world, educators fully understand that those questions are undoubtedly worth exploring – and EdTEchRVA offers a perfect opportunity to do just that. Be bold, try something new! Our kids deserve it. Stacie Taylor is in her 7th year as an Instructional Technology Resource Teacher with Hanover County Public Schools after teaching US History 1 for almost 10 years. She currently serves as the EdTechRVA2019 Conference Chair for the GRAETC Committee. You can follow her on Twitter @sctaylorITRT. After teaching English for 21 years, almost entirely in Henrico County, Gillian Lambert is now in her second year as an ITRT at Powhatan Middle School in Powhatan County. You can follow her on Twitter @GillianLambert.